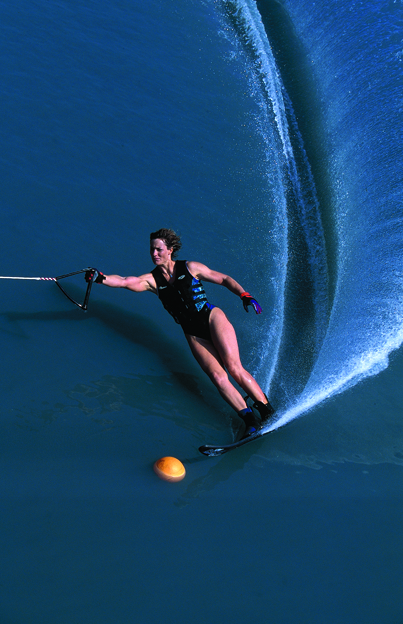 In her thirty-five-year water ski career, Kristi Overton Johnson fell every day. Yet in the midst of her falls and failures, she became one of the most decorated women water skiers of all times, holding the world record in women’s slalom from 1992-2010 and accumulating over 80 professional world titles. Her experiences as a professional athlete and her relationship with Jesus Christ taught Kristi the valuable truth that falls don’t prevent victory—on the water or in life­­. Instead, it’s how one respond to the falls and which power source one connects to that determine the outcome. It is this message of perseverance, truth, and hope that Kristi has dedicated her life to sharing. Since 15 years of age, Kristi has spoken nationally and internationally about a God of another chance. Her message has been especially impacting within the prison system. In 2013, God used a simple visit with an incarcerated friend to open Kristi’s eyes to the hopelessness of life behind bars and the need for imprisoned men and women to know the God of second chances. Since them, Kristi and her ministry team have been committed to being a voice of hope to inmates across the United States through its Victorious Living magazine and on-site prison events. To date, over one million incarcerated souls have been impacted! This message of second chances, however, isn’t just for inmates. It’s for anyone feeling overwhelmed by the waters of life, something Kristi experienced herself as she struggled to find balance in her roles as an athlete, wife, mother of 3, and ministry leader. Decades of chronic illness caused by never-ending performance, perfectionism, and people-pleasing showed Kristi that you don’t have to be behind literal prison bars to find yourself imprisoned. Let Kristi’s personal journey to freedom, authentically told through her gift of storytelling and practical application of God’s Word encourage, equip, and empower your audience to grab hold of the God of second chances and move toward His victory once and for all.